Opium Production in Afghanistan Research Papers discuss the background on opium production and the Afghan's government response. The United States and global war on drugs targets several foreign countries. This essay will examine opium production in Afghanistan, and its relation to the war on drugs. Specifically, it will review the background of opium production in the Afghanistan, the Afghan government's response to opium production, and the methods by which opium was transported to the United States. In addition, it will discuss the effects of Afghan opium on the United States, the U.S. government's efforts to stop Afghan opium production and exportation. This discussion will demonstrate that the production of opium has been a vital part of Afghanistan's economy for many years, and efforts to eradicate its production offer temporary results, at best. And with most of the United State's anti-drug efforts focused on cocaine-producing countries, such as Colombia, the U.S. efforts to eradicate Afghan opium production have been minimal. Opium has a long tradition in Afghanistan for medical and culinary purposes, but usage was never widespread or as socially disabling as in neighboring Iran or China of the Ch'ing dynasty . According to an author , Afghan opium production was linked to events in Iran prior to the 1970s, where its usage became a major problem in the early twentieth century . MacDonald claims that Afghan involvement in the international drug trade began in the 1970s when large numbers of Westerners came to Afghanistan to use its potent hashish and opium. After the coup, the new government tightened both visa and drug controls, forcing many Western drug users to leave the country . A substantial increase in foreign demand for opium the early 1980s made opium cultivation important for raising cash for war efforts. MacDonald claims that guerrillas, peasants, and criminals all planted and harvested poppies, and prune, irrigate, and harvest them, then smuggled raw opium across Pakistani border . From there, opium and heroin from Afghanistan goes into India and to Sri Lanka by overland and air routes, while other routes lead from Pakistan to Hong Kong and Malaysia and then to North America; or across Iran, Turkey, and Lebanon by land and then on to Europe, or by sea through the Indian Ocean to the Red Sea, through the Suez Canal and from there on to Europe and North America . Baldauf agrees that opium has always been a part of the Afghan economy, and adds that it has played a role as currency as well as a form of savings for many farmers, who would cash in their opium supplies in hard times . According to an author , opium only became a major funding source for weapons in the early 1990s, when the mujahideen began fighting Soviet troops . 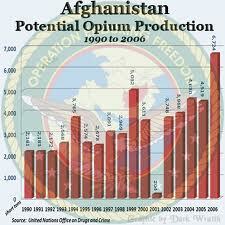 By 1997, Afghanistan produced 2,800 tons of opium annually, more than 80 percent of the total world supply. Paper Masters writes custom research papers on Opium Production in Afghanistan and discuss the background on opium production and the Afghan's government response.